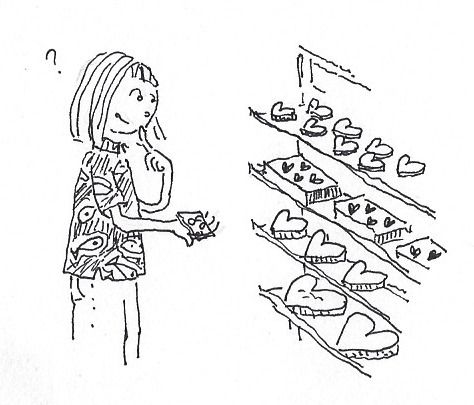 Here is a story about chocolates and Valentines Day. Whether or not you're into Valentine's Day, you're probably into chocolate. In 5th grade, I was not high on the social ladder. I had a crush on a boy named Jason, who had strawberry blond hair and was quite popular in our class. I didn't have much to offer, but I was good at drawing. I told him I would draw a picture for him and so he asked for a picture of his favorite football player, who was from the Dallas Cowboys. I decided that Valentines Day would be a peak moment to reveal my affections for him. 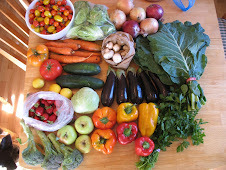 I saved up my monies and went down to Woolworths. 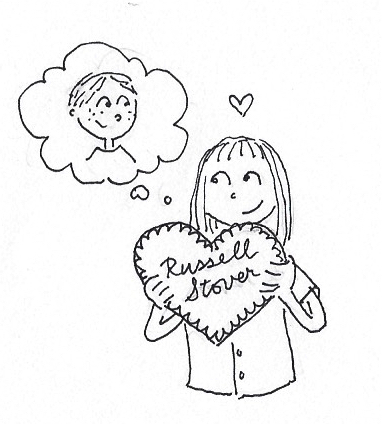 After much careful consideration of the options, and a review of my financial situation, I selected a large, shiny red, heart-shaped box of Russell Stover chocolates to give to him (not vegan!). I felt very mature. On Valentines Day, I brought this box to school with me. At recess, I put my heart-shaped box in my backpack and as I was crossing the playground to make this risky declaration of my love, someone came and told me that Jason had just asked Melinda to be his girlfriend. Calamity!!! I played it cool, because that's what you do, but I was quite sad. I took the box of chocolates home and hid it in the freezer. I couldn't stand to look at it, but I couldn't throw it away either. I didn't want to eat it, because that would be such an admission of my social defeat, but - then again - it was a perfectly good box of chocolates. I have no idea what I told my parents, but I'm sure they didn't know the whole story. Anyhow. It was a long time (months?) before I finally broke down and ate the chocolate. At least I got myself some nice chocolate out of that deal. On a happier note, the kind folks at Sweet Designs Chocolatier recently sent me some chocolates to try out and I got to enjoy them without any emotional complications or hesitation. 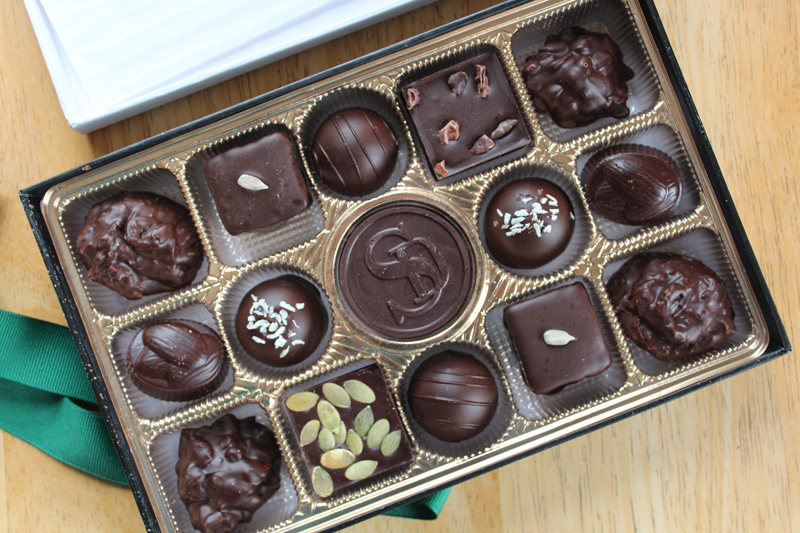 Sweet Designs makes some non-vegan chocolates, but they also offer this all-vegan, organic and gluten-free box of chocolates. They are kinda hippy chocolates, and I mean that in the best possible way - dark chocolate filled with sunflower seeds and dates, or with salted almonds, or with pepitas. There are also two coconut truffles and two chocolate truffles in the mix. But nothing like caramels or super-sugary cremes inside. I sometimes enjoy those super sugary chocolates, but I actually really appreciated the simplicity and relative healthiness of these treats. Plus, the chocolate itself is just really, really good chocolate. That is muy importante. The gal who sent me these goodies also included two packages of their vegan "bark," - which is basically slabs of dark chocolate with yummy stuff mixed in. 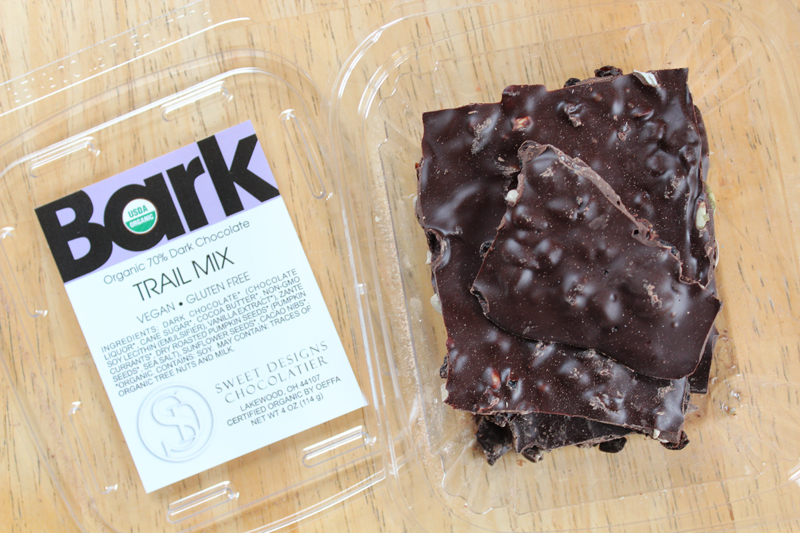 I know it's easy enough to make one's own bark, but it is even easier to go to the cupboard and open a package and start eating chocolate. Ha! This one had trail mix in the chocolate - and some of the trail mix bits were sweet (currants) and others were a little salty (pepitas) and it was really delicious. Suffice it to say, this package has long since been recycled. I shared with Mr. VE&T, because I am not all bad. 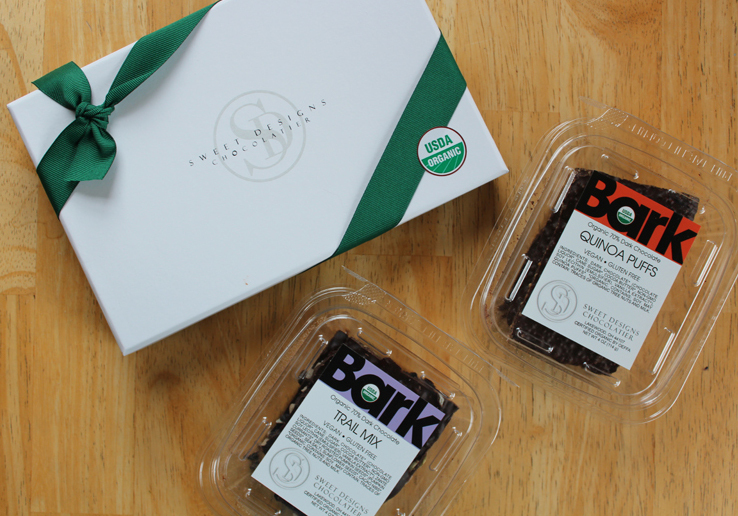 They make a selection of vegan barks - cranberry, salted almond, pepitas, and cinnamon heat -- in addition to the two flavors I tried. I'm curious about "Cinnamon Heat"!! Somewhat to my surprise, this Quinoa Puffs chocolate bark was the star of the whole show as far as I was concerned. I loved this stuff!! It's like a Nestle Crunch bar, but vegan and better. I didn't really share this one with Mr VE&T, because I am a partly bad person. He isn't even vegan, so he can get himself a Crunch bar anytime he wants. This chocolate was super delicious, and the quinoa crunchies don't really add any flavor, but lots of fun crispy-crunchy texture. These chocolates aren't fair trade, and I generally only buy fair trade chocolates, but it's also my understanding that buying organic chocolate is a close second to buying fair trade. With some research, I've learned that the organic growing process involves enough oversight that there won't be any slave labor or child labor involved, and that's a bare minimum for me as far as chocolate sweeties go. So, I still feel good and happy about enjoying these treats. If you're thinking of buying chocolates for your valentine this year - I wish you better luck than I had in the 5th grade. Or, you can take the alternate route and just buy yourself a big box of chocolates and skip the heartache and uncertainty altogether. Aw, I so feel your pain! I got a little Whitman's Sampler almost every year for one boy or another when I was in elementary school, and it never went well. That's sad that you kept your chocolates in the freezer, because you were so disappointed. On the plus side, at least you found out about the Jason + Melinda affair before revealing your feelings. Hugs to fifth grade Amey! Ooooh, harsh! At least you found out before you ended up giving it to him! Great story, and I'm impressed with your chutzpa at making the first move, even though it didn't work out. Funny how the quinoa bark seems to have been everyone's favorite. I keep mine hidden, though I do share the rest. :) Wonderful review — I think they should send you another box! Awww, Amey, such a cute story! 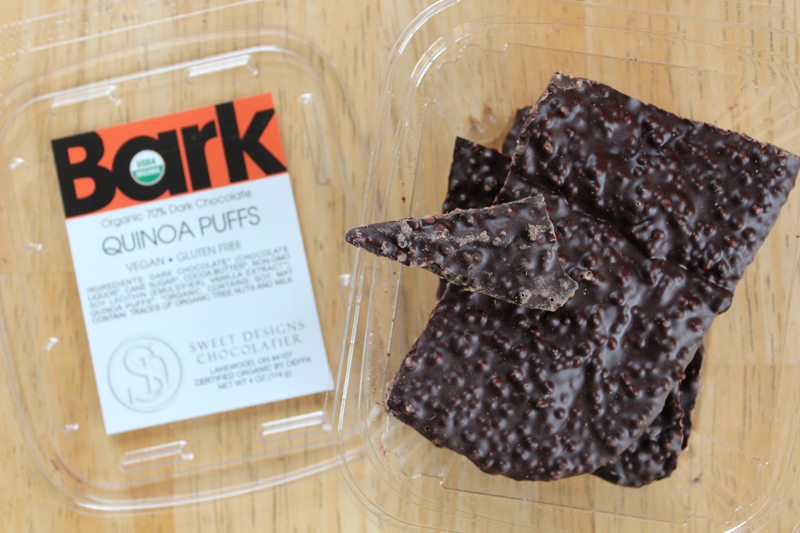 I am also a huge fan of bark and puffed quinoa in chocolate - it's totally reminiscent of a Nestle Crunch! Before Nick was vegan I refused to share the super fun chocolate treats with him too because he could totally go out and get cheapo dairy milk whenever he wanted - now I share which is both good and bad! 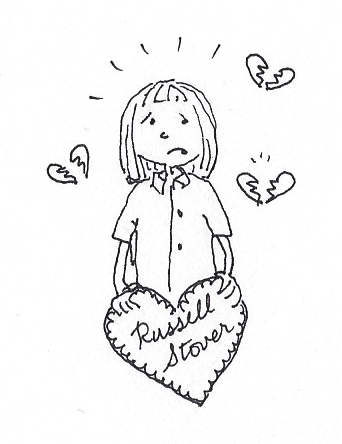 Unrequited love, story of my younger self! 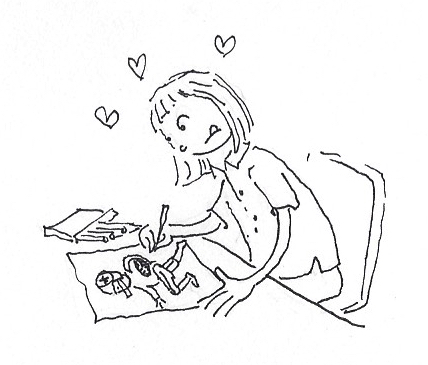 Did you keep the drawing or give it to him with heartfelt indifference? V-day in elementary school was so intense. I stood back from it, seeing the boxes stuffed with cards and others airy, almost empty. We adopted our dog on Valentines Day so arbitrarily celebrate it as her birthday and spoil the old lady ;) Interesting tip on organic chocolates - I always go for fair trade too. [ Smiles ] Oh my goodness, I felt your pain while you told that sad story. On a bright note, there is always vegan chocolate to indulge in. Oh man, I had crushes on everybody in elementary school! I never had the guts to act on them though. I'm so impressed with your 5th grade self.